If you cannot get the exact same product, you can substitute it with any kind of cookies or chocolates that have similar shapes. Put 1 bag (218g=7.7oz.) of chocolate in a small bowl. Place the bowl over a large bowl of hot water and melt the chocolate until smooth. Spoon the chocolate into the mold. Carefully drop the mold on the counter for a few times to remove air bubbles trapped in the chocolate. Cool in the fridge for 30 minutes. 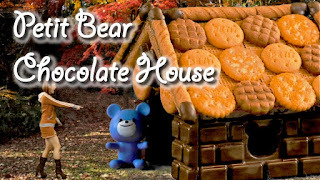 *The leftover chocolate will be used to build the house and attach the decorations, so do not eat it! Gently attach 2 sets of 4 wafers each to make the roof. Refrigerate them for 15 minutes to set. Then attach petit cookies and crackers. Dip both sides of CHUEL milk chocolates in the melted chocolate and attach them on the roof. Carefully release the chocolate from the mold. Build the walls on the board using the leftover chocolate. Attach the roof on the walls and finish with CHUEL milk chocolates. You can decorate the house with sprinkles and candies if you want.